May is traditionally a busy season for Korean buyers at overseas racehorse sales. This year, however, the nation’s equine shoppers have also returned home with additions to the peninsula’s breeding stock in the shape of established Australian sire Delago Brom and recently retired superstar Japanese racehorse Air Shady. Delago Brom [Encosta De Lago – Brompton Cross (El Qahira)] only raced ten times but among his four wins was the 2003 Australian 2000 Guineas. 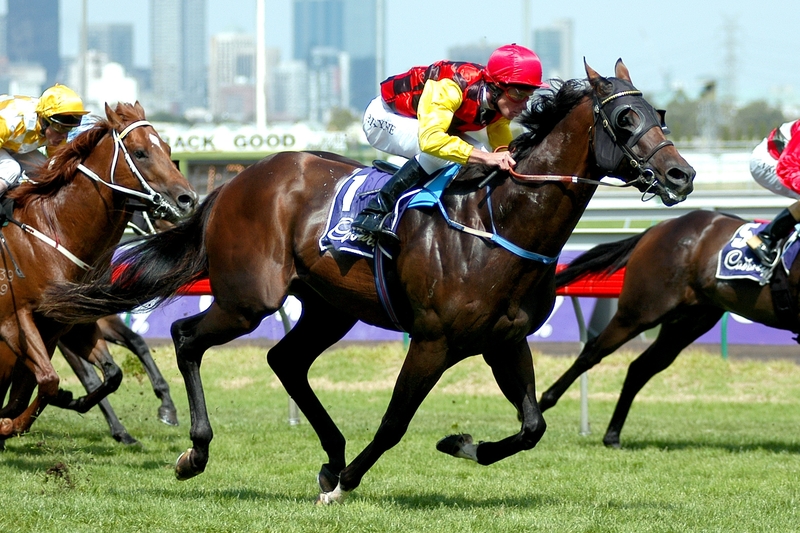 An A$80,000 purchase at the Inglis Great Southern Bloodstock Sale in Melbourne, he’ll be standing on Jeju Island for the 2012 breeding season. Among the small number of Delago Brom’s progeny who are racing in Korea, the most successful is four-year old Dudeurim who has four wins from fourteen starts. Delago Brom is a very welcome Australian addition to the US dominated sire-ranks in Korea. Joining Delago Brom in Korea will be Japanese born Air Shady. Son of the legendary Sunday Silence, Air Shady [Sunday Silence – Air Deja Vu (Northern Taste)] was officially retired from racing in Japan only two weeks ago. 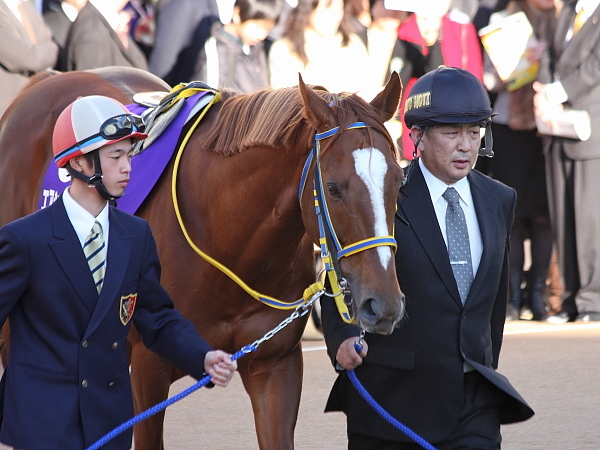 His early racing years were blighted by injury and it was not until he was seven years old that he won his first Group race but, with his six-year career, Air Shady became one of the most popular racehorses in Japan in recent times. It will be fascinating to see what kind of mares get sent to Air Shady and whether he can repeat the success of fellow Japanese sire Meisei Opera who, despite being totally unheralded, sired this year’s KRA Cup Mile winner Soseuldaemun. While Delago Brom and Air Shady are, along with Officer, the highest profile recent additions to the stallion ranks, a number of racehorses have been retired to stud so far this year. New Korean bred sires are Nice Choice (Lost Mountain), Money Car (Newsprint) Secret Weapon (Native Regent) and Rainmaker (Revere). Secret Weapon is potentially the first second generation Korean stallion. Foreign bred horses retired from the track to stud are Angle Slam (Gold Case), Angus Empire (Lion Cavern) and Florida Native (Kissin Kris). Additionally, Colors Flying (A.P. Indy) and Limitless Bid (Sunday Silence) have been imported from the US and Japan respectively. * Picture of Delago Brom is by Ross Holburt of the inimitable Slickpix while that of Air Shady is by Ishida Kazushi of the HimawariKazushi racing blog. Just when it looked like it couldn’t get any more depressing, the K-League “Match-Fixing” saga did just that today as a second footballer linked to the fixing of professional football matches in Korea was found dead at a hotel in Seoul. Jung Jong Kwan of K3 side Seoul United, and formerly of K-Leauge outfit Jeonbuk Motors, wrote in an apparent suicide note that he was a broker involved in the fixing of matches. So far, five players have been arrested and the affair is also thought to have led to another player, Incheon United goalkeeper Yoon Gi Won, taking his own life earlier this month (although Yoon’s death is yet to be formally linked to match-fixing). No mater how it plays out, it is clear that for all aficionados of Korean professional Sport and especially those who enjoy the occasional (legal) punt, things are not going to be the same for a very long time. 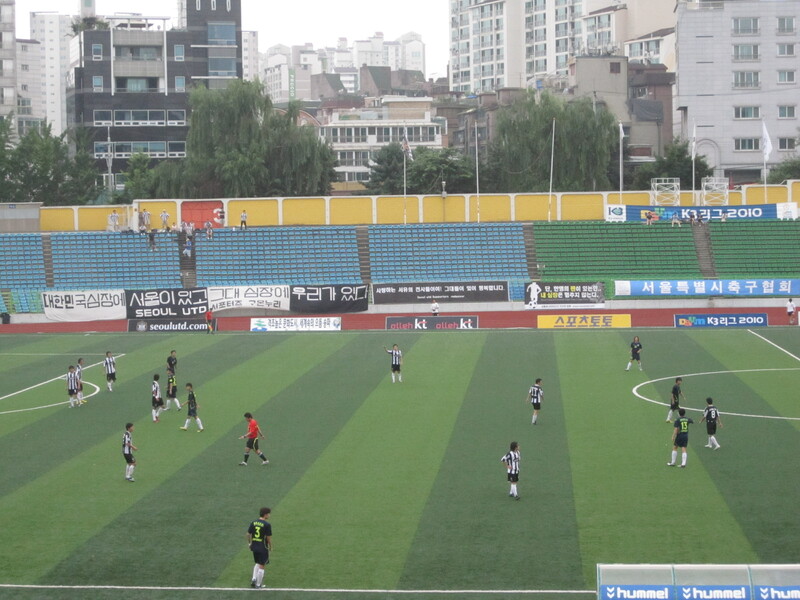 Betting on football matches in Korea is legal through a quasi-governmental organisation called Sports Toto but it is far from clear as to whether the fixing – which has been confirmed to include a match between Daejeon Citizen and Pohang Steelers in the League Cup (equivalent to the English Carling Cup) earlier this season – involved was designed to benefit bets wagered on correct score betting on the Toto or on illegal markets. See this thread on the Rokfootball.com forum for an excellent summary of the situation and hypothesis on how the fix may have happened. The K-League has two types of clubs. The first type are the corporate-owned ones; FC Seoul (LG/GS), Suwon Bluewings (Samsung), Jeonbuk Motors, Ulsan Tigers & Busan I’ Park (all various incarnations of Hyundai), Jeju United (SK) and Pohang Steelers (POSCO). Also included in this group is Seongnam Ilhwa, owned by the Unification Church of Reverend Moon Sun Myung (better known as “The Moonies”). The others are “Citizen” teams, without a large backer. Without the financial clout of their rivals they are unable to offer big salaries and usually make up the also-rans in the K-League championship. All players implicated so far have been members of Citizen clubs. Just as in racing in Korea, the gangs know who to target. Worse still there are rumours that K-League clubs knew exactly what was going on but opted to quietly terminate the contracts of players they knew to be involved in accepting bribes. If true, this is potentially devastating both for the K-League and for legal betting in Korea. The National Gaming Control Commission do not miss a trick in their war on legal gambling. The K-League has asked Sports Toto to remove its matches from its products, at least for the forseeable future. This is dangerous. Once this happens, organised crime will once more hold the monopoly over football betting in Korea, just as they do over off-track horse racing betting in many parts of the country since the enforced closure of the KRA’s “K-Netz” internet and telephone betting service. Two men are dead and others are languishing behind bars. It’s both a human and a sporting tragedy. But it is not the fault of Sports Toto. As long as competition occurs, there will be those who will find a way to bet on it. Making the legal means to do so as attractive as possible is to everyone’s benefit. 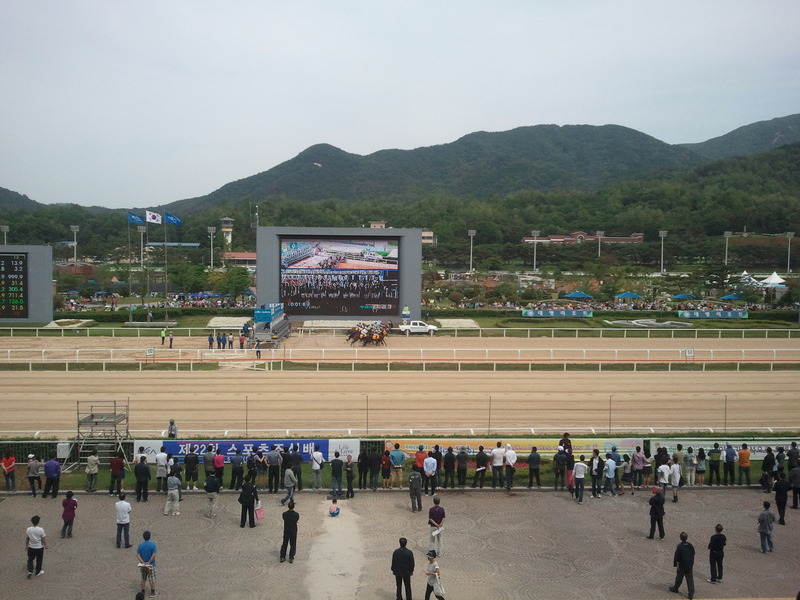 Yodongjewang led home a trifecta of outsiders to win the Sports Chosun Cup at Seoul Race Park this afternoon. In what is traditionally one of the biggest betting races of the year, the 12/1 shot held off Tamnaseontaek to take a half-length win and give rising star jockey Jo In Kwen his first ever Stakes win. Punters eventually sent four-year old colt The Almighty off as slight favourite and he showed at the front early along with outsider Jangbi Sarang and the well-fancied Namchonuichukje. All of these fell away in the home stretch of the nine furlong race though as Jo Kwen took Yodongjewang, who was always handily placed into the lead and outsprinted Tamnaseontaek and the fast finishing Yeongtap to claim the victory. A stewards’ inquiry didn’t change the placings of the first three and Yodongjewang scored just his fourth win of a twelve race career to date. For jockey Jo In Kwen, it was a first ever Stakes victory. Just two weeks ago the 24-year-old reached the milestone of 100 career winners and today confirmed his place as the hottest young riding property at Seoul. 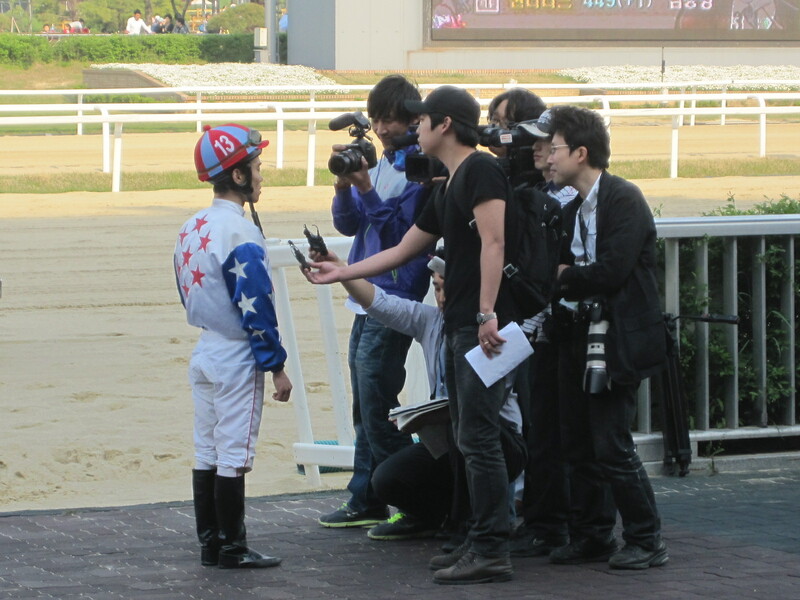 If the rumours of Busan’s Jo Sung Gon heading north to the capital prove true, there is going to be a lot of young talent in the weighing room. Some punters also went home happy; the trio (picking the first three horses in any order) in the Sports Chosun paid 2134/1. The long shots weren’t done there. In the feature handicap an hour after the Sports Chosun, 74/1 Out And About (Outflanker) scored a very unlikely victory over Captain Cugat and odds-on favourite Baekjeonmupae. 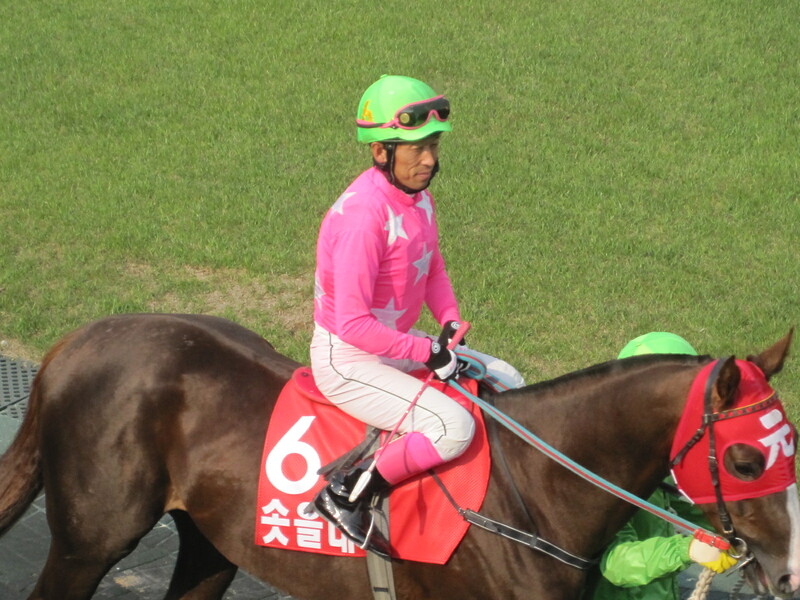 It was five-year old Out And About’s first attempt at class 1 and he was given a great ride by Park Byeong Yun who was a late replacement for Moon Se Young who was unfortunately injured during racing yesterday. Down at Busan, the feature race went the way of Mulbora, who scored an impressive win over KO Punch and last year’s Champion Juvenile Bulkkot Gisang. 2008 Derby winner Ebony Storm was fourth in the event which was run over a mile. Ebony Storm, the longest shot on the board when he won his Derby in a monsoon downpour at Seoul three years ago never really followed up on that success. Indeed, so disappointing was he that he managed to get himself gelded. SInce then, he has re-emerged as a useful sprinter and consistently picks up money finishes. As for Mulbora, it was a second consecutive victory and his eighth in total. So concludes another weekend of racing on the peninsula. It was a glorious day today but next week it’s forecast to get hot. Very hot. Just a week after Gwangyajeil’s triumph in the Korean Derby, the Stakes race Winner’s Circle at Seoul Race Park will be back in use again this weekend for the 22nd running of the Sports Chosun Cup. It’s one of Korea’s longest running sponsored Stakes races and a full field of fourteen will contest the event, run over the Derby distance of nine furlongs, on Sunday afternoon. The race is open to class 2 Korean bred horses aged 4 and upwards so therefore, while there won’t be any stars on show, it makes for one of the most open betting races of the year. All are proven winners without having made the big step up to class 1. One of the fourteen will do that on Sunday. See below for a full list of runners and riders. Away from the Sports Chosun, a number of big names will be in action over the weekend. Triple Seven headlines Seoul’s feature race on Saturday while 2008 Derby winner Ebony Storm goes in Busan’s Sunday main event. After six years officiating for the KRA at its Seoul and Busan Racecourses, Australian Brett Wright is returning to his homeland to take up a position with Racing Victoria. 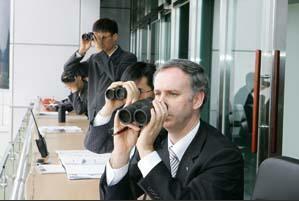 Wright was behind the binoculars for the last time in Korea at Busan’s meeting this past Sunday. After joining the Racing Office of the Australian Jockey Club in Sydney in 1979, Wright eventually became a steward and, after 21 years’ service in Australia took up a position in Macau in 2000 where he would stay for four years until coming to Korea to take up a position as stipendiary Steward and “Special Consultant on Racing Issues” with the KRA – a position that was created as part of the KRA’s “Internationalization” program. During his time in Korea, Wright was on the panel at Seoul Race Park before transferring to Busan where he became Chief Steward in late 2008. While the rest of the internationalization program is still in its infancy, Wright – joined later on by fellow Australian, the late James Perry – has nevertheless been instrumental in a number of initiatives that have helped racing here develop. Tangible developments such as the introduction of new equipment – pacifiers being the best example – and the production of English language stewards’ reports are the most obvious. However, behind the scenes progress in terms of welfare issues, bringing rules – including those related to use of the whip – more in line with international standards and generally assisting in raising the standard of stewarding in Korea, will perhaps be considered more important achievements of his tenure in the long-term. With Brett Wright’s departure, it leaves James Smith at Seoul as the only foreign steward on the peninsula. However, Wright will be replaced with hiring of a new steward – most likely American this time – for Busan currently in its final stages. Busan will also recruit a foreign Handicapper. Horse Racing in Korea wishes Brett Wright and family all the best in Australia. 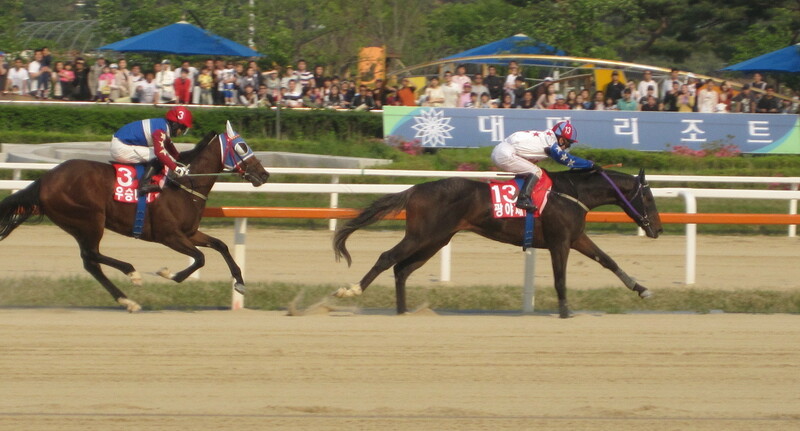 Gwangyajeil is the winner of the 2011 Korean Derby. The pre-race favourite overcame the valiant effort of filly Useung Touch to claim the second leg of the Korean Triple Crown by two and a half lengths. In what was the most open looking Derby field for years, Gwangyajeil was sent off the very slight 4/1 favourite ahead of Singgereounachim and Double Light. As expected though, it was the Busan based filly Useung Touch who set the early pace and got to the first corner in the lead. KRA Cup Mile winner Soseuldaemun, rated as a 6/1 chance, ran into trouble right away and found himself at the back of the field as they rounded the first corner. However, Toshio Uchida on board, Soseuldaemun caused a stir in the back stretch as he joined fellow Busan challenger World Winner in coming right around the outside of the field to join the front-runners. Gwangyajeil and Oh Kyoung Hoan meanwhile sat safely in the middle of the pack. Rounding the final corner, Useung Touch still had the lead while Uchida found himself four wide on Soseuldaemun. Now it was time to strike for Gwangyajeil. Shifting to the outside at the top of the stretch, he went past Soseuldaemun as if he wasn’t there. Shoot In and Double Light similarly saw their challenge collapse. The battling Useung Touch was the last to succumb but once Gwangyajeil had her collared with a furlong to go, there was to be only one winner. The filly held on for second from the fast finishing Singgereounachim and outsider Champion Belt. 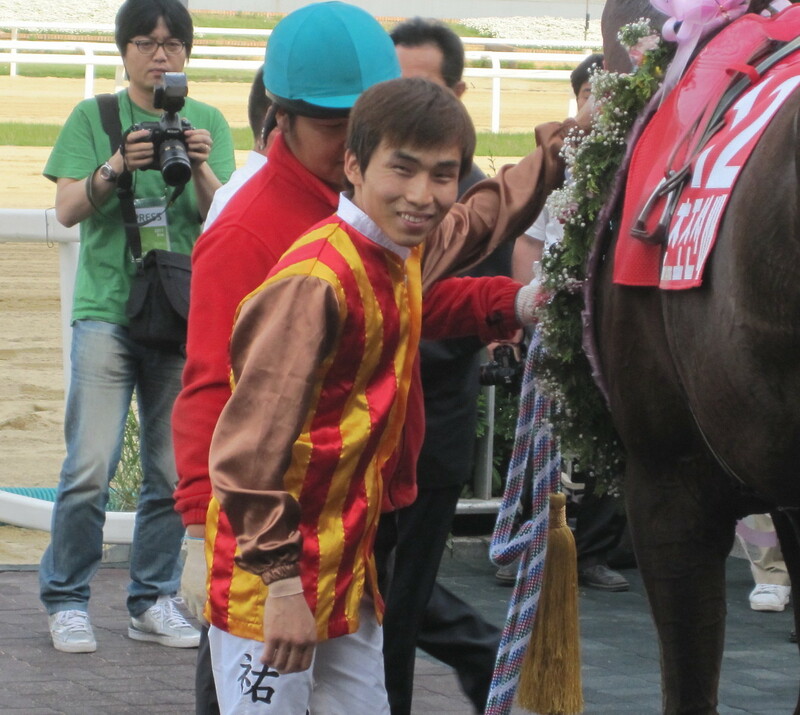 Soseuldaemun – who had lost 26 kilos since his KRA Cup Mile win – finished in seventh, once place behind Double Light. Well-fancied Geuma Champ was a disappoiting thirteenth while bringing up the rear was 2010 Champion juvenile Sun Hero, who played up in the paddock before the race and is looking increasingly difficult to control. 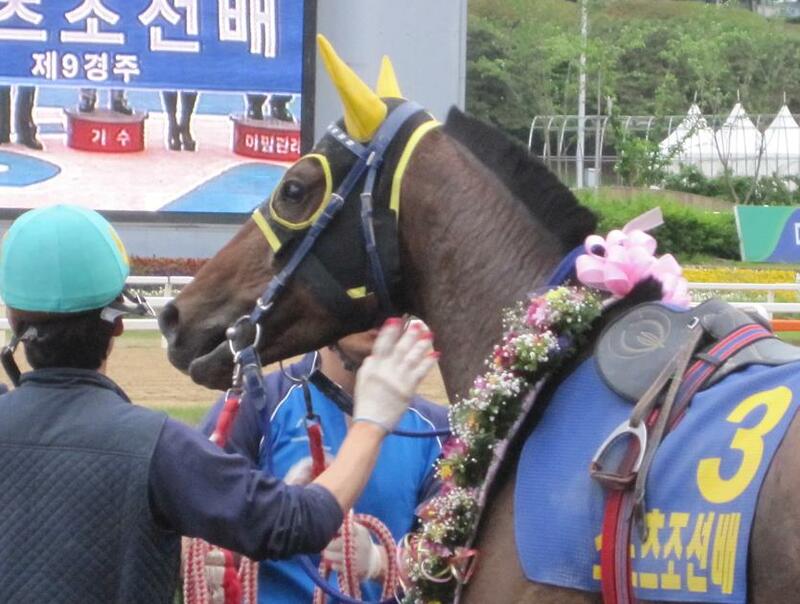 Gwangyajeil [Vicar – Hurricane Havoc (Jade Robbery)] now has a record of five wins from his seven starts. Vicar, whose foals had long been popular with Korean buyers at American sales, was imported to Korea in December 2006. Gwangyajeil’ s triumph means that he has a Classic winner among his first crop of foals to reach the racetrack. As for jockey Oh Kyoung Hoan, while he did win the Grand Prix Stakes in 2004, this will surely go down as his biggest victory to date. For trainer Lim Bong Chun it is by far and away his biggest success. It is also a welcome victory for Seoul. The capital city hosts the Derby but hasn’t provided a winner of it since the race was opened up to competition from Busan in 2008. Could the tables be turning at last> We’ll find out when this crop of three-year olds re-convenes back at Seoul in October for the Minister’s Cup, the final leg of the Triple Crown. 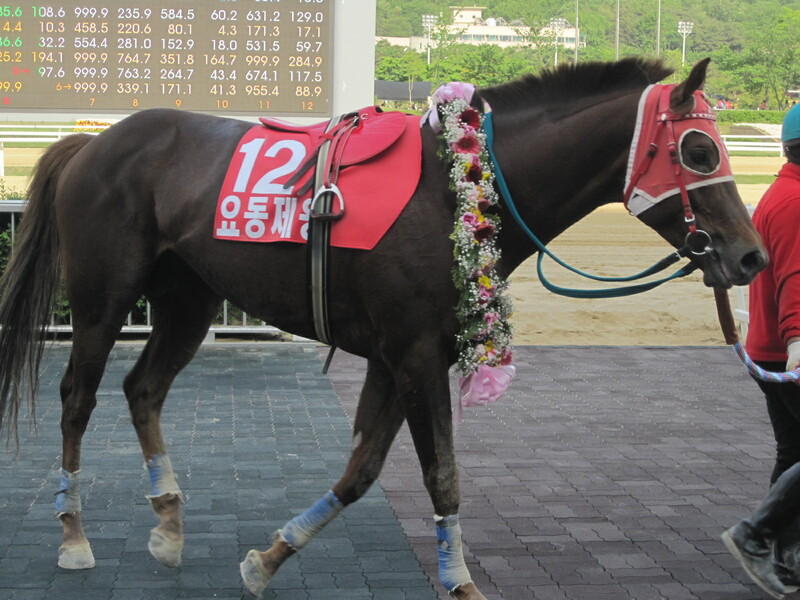 With Soseuldaemun’s defeat, a Triple Crown won’t be on the line, but plenty else will be. * Down at Busan today, names from Derby’s past were present. 2010 winner Cheonnyeon Daero faced 2009 runner-up Namdo Jeap in the first of co-feature events but they were both upstaged by Joe Murphy trained Udeumji, who beat them into the minor placings in a tight finish. 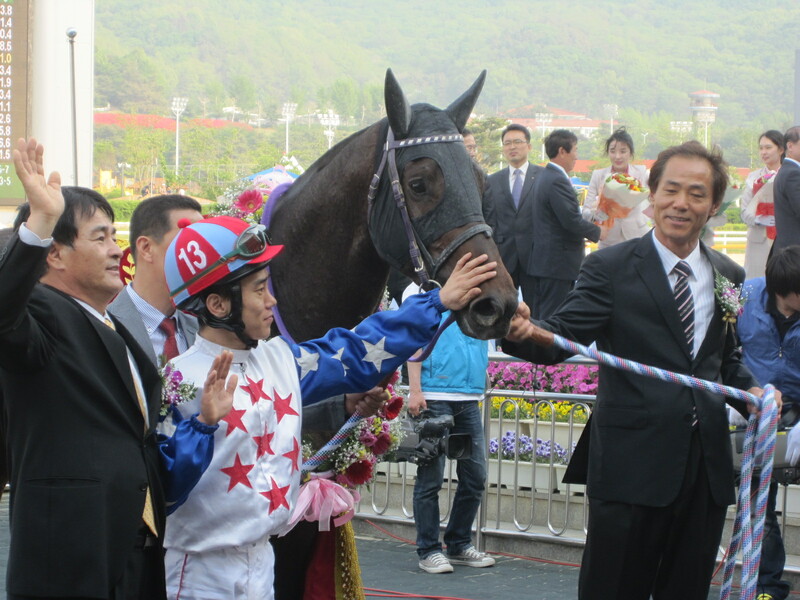 In the second co-feature, Yeonseung Daero, fifth in Sangseung Ilro’s 2009 Derby, scored the fourteenth victory of his illustrious career with yet another victory over foreign bred opposition. This time, he got the better of Daldeongi and track stalwart Crafty Louis by a neck on the line. If Gwangyajeil goes on to have the same sort of career as Cheonnyeon Daero, Yeonseung Daero or even Namdo Jeap, he’ll be quite a horse.